It’s been nearly a year since Vanguard and Schwab launched automated advice platforms, stepping into the fray against roboadvisors and apparently winning. As we’ve discussed, the end may be near for the Wealthfront as the big boys are close to knocking the upstarts out of the fight. 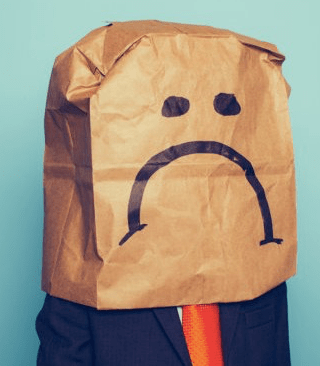 Meanwhile, a presumed lightweight in the battle for digitally-managed assets has been quietly hammering away, making impressive inroads into the coveted market for Millennial investors. Acorns has not been included in the media hype when roboadvisors are discussed. Acorns offers a mobile app that lets users link their bank and/or credit card and automatically rounding up the cost of transactions to the nearest dollar. They withdraw that spare change to invest in a portfolio of ETFs. It’s an effective strategy to nudge investment-averse Millennials toward a lifetime of investing and it appears to be gaining traction in a big way. Roboadvisors have been in a race to grow AUM, seeing this as their yardstick of success. This is in contrast to technology startups, who measure value on the size of their user base. Acorns’s AUM, a paltry $73.6M as of year-end, is not significant. It’s their user growth that deserves attention. Over the last year, Betterment and Wealthfront’s AUM have flat-lined. This has left their VC investors eyeing an exit with increasing unease, while Acorns, not burdened with AUM fixation, has been on a tear. Acorns has grown its user base to 750,000 since 2014, including a 57% increase in just the past two months. The company is just now beginning to launch internationally. This user growth is even more impressive given the recent stock market volatility. They are certainly not worried that Millennials will quit the investing game at the first sign of market weakness. Compare this to the number of accounts at the standalone robos. 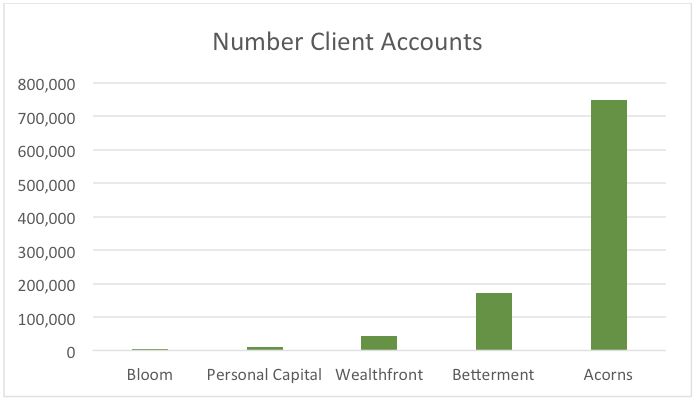 Wealthfront has a measly 35,000 accounts while Betterment more than doubles them at 75,000. This is chicken scratch compared to Acorns. Extrapolate their user growth over the rest of 2016 and it’s possible that they could have close 2 million client accounts by year-end. Imagine all of the possibilities for finding additional revenue sources from their user base? That is what drives valuations. Could Acorns offer recommendations for insurance products or credit cards like Mint.com? Maybe. Or perhaps they could mine their clients’ financial transactional data that is flowing into their database and find other products and services they need. This could be quite lucrative. Wealthfront’s VC backers, who have pumped in $130 million so far, had every reason to expect a rich valuation, given that their last round of funding valued the company at around $750 million. When Blackrock purchased FutureAdvisor, which had less than $600 million in AUM, for a reported $150 million, expectations were that Wealthfront might be the next acquisition target. However it’s beginning to look like the first of the automated wealth management firms to reach a $1B valuation may be Acorns. If, for the sake of argument, Acorns did reach 2 million users this year, a $1B valuation would equate to around $33 per user. How realistic is this? Certainly Acorn’s average account balance of just $156, compared to Wealthfront’s approximately $80,000, makes Acorns appear a long way from Unicorn status. But Acorns has a longer-term game plan. Millennials have assets estimated at over $2 trillion and as they pay down the burden of college loans, increase savings and inherit wealth, this demographic will eventually bypass Boomers as the wealthiest demographic and the core focus for wealth managers. For aspiring investors, starting small can be a good thing, as long as they keep going. “It’s easier to part with $1 fifty times than it is to part with $50 once,” said Jeff Cruttenden, co-founder of Acorns. As the number of Acorns clients continue to grow exponentially, the company is establishing itself as a trusted brand in the eyes of the crucial Millennial demographic. Acorns is positioned to scale it’s users into a higher revenue mix of products and services in the future. It won’t be long before $33/user is a sensible valuation for Acorns. Even if Betterment and Wealthfront double their AUM to $8 billion in 2016, according to some analysts, it may not be enough for them to survive. Acorns, on the other hand, is poised to survive with an efficient, far-sighted business model. They charge a flat fee of $1 per month, which is a simple figure that clients can understand. Of course, they do not seem to realize that based on a $156 average account size, $12 annually amounts to a whopping 7.7% fee! Their fee multiplied by 750,000 clients equals $9,000,000 in gross revenue. 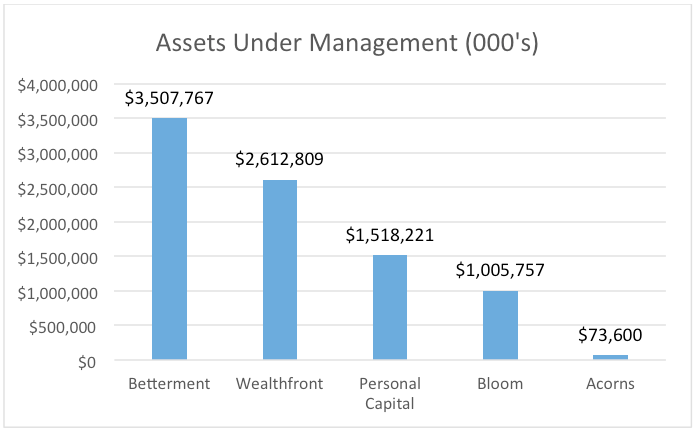 Wealthfront is estimated to be generating around $6,000,000 and Betterment has approximately $4,000,000. Acorns seems to be under no pressure to compete on fees with other automated advisors. When your service has become commoditized, one way to compete is on efficiency and keeping costs low. This is an area that Acorns is also ahead of their robo brethren with only 77 employees, according to news reports. That is less than half of other firms in the space. This is the kind of efficiency needed for long-term staying power. Trust has always been key in the business of wealth management. Engineers, like Wealthfront’s CEO Adam Nash, have been the driving force behind the technologies that have disrupted many entrenched, bloated industries in recent years. Nash has boasted that Wealthfront is built as a software company designed for a new generation of investors. But Wealthfront has made the mistake of going toe-to-toe with the wealth management behemoths who have built trust over decades. Acorns, by focusing on slowly building the trust of Millennial clients, is positioning itself to be a survivor. Acorns seems to understand what Wealthfront does not: Trust cannot be engineered, it has to be earned over time. Thanks! if you would like to subscribe to our newsletter, you can enter your email into the box at the top if the screen. You can also follow me on Twitter @craigiskowitz. Craig, very good article and you are definitely hitting the pertinent points here on user numbers. We are trying to build a proposition that has user scale similar to Acorns and apps like Spotify before focusing on AUM. Running peoples money is a long game and if you get the proposition right client assets should be sticky. We also liked your other article http://www.iris.xyz/insights/dead-robo-walking-why-wealthfront-doomed. Let us know how we can subscribe to your blog!